Yesterday I had an incredible day of travel hell stuck in the not really air conditioned La Guardia Airport for 9 hours – the only food option once through security was a petite Au Bon Pain. I was suppose to land in Toronto at 5 I landed at 11ish and was glad I was at least able to fly last night as the horror of having to go home and then back again to the airport today would have been beyond hellish. So what does one do in an over heated, over full, dumpy airport for 9 hours? When not boarding and un-boarding a plane that never took off (we did have a lovely drive around the tarmac, but sadly that terrible storm prevented us from actually taking off). What I did was nosh I noshed my way through 9 hours of tedium, trapped at LaGuardia’s Gate 5. The first thing I noshed on was a Garden Salad. Then later an Oatmeal Cookie, a Asiago Cheese Bagel and a 10 Vegetable vegan soup which was very tasty. It was all very tasty for airport fast food. Before I get to my point I have to say I admire Au Bon Pain for being so up front about the nutritional value of their food, in the main cafe before security they even have a computer with a search able data base of everything they sell so you can check out what it is your eating, what’s in it and how fattening (or not) it is. What got me was the label on my Garden Salad. The dressing was a separate package so this only includes the salad. Now really how many ingredients can you possibly have in a salad? You may ask. Well here is the answer, the salad is basically one ingredient: mixed greens. The culprit to this encyclopedic label are the 6 croutons that sit atop the salad. 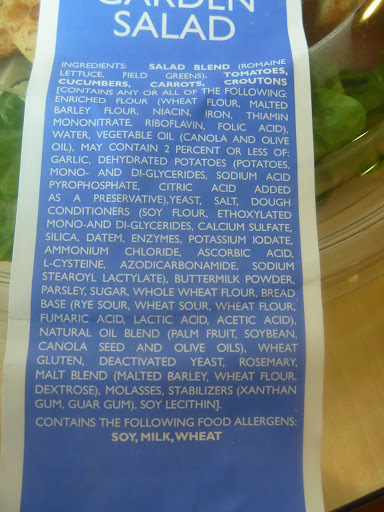 Not including all the “exceptions” I counted 21 ingredients in the croutons….which are bread…right? Croutons are made from stale bread which when last I made bread contained flour, water yeast and salt. If you double click this image it will enlarge for your reading pleasure. Lots more on Toronto, but first I have to get caught up on sleep. An alarm clock possessed by demons went off this morning at 6 (I’d been in bed for three hours) so I unplugged it and then 10 minutes later it went off again! So I hid it in the closets with the washer and dryer. In reality it was only alerting me to the construction noise that was about to begin at 7:30. I thought New York was loud! This entry was posted in Travel and tagged Airport food, Au Bon Pain, LaGuardia Airport, Travel Hell. Bookmark the permalink.